Multicolored Asian ladybeetles are not native to Wisconsin. 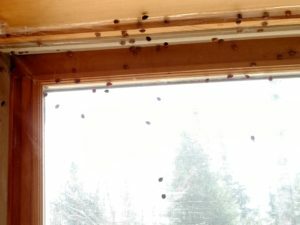 Although there are numerous native ladybugs in the state, only the Asian variety are known to aggregate in buildings in the fall and become nuisances. In their native range, multicolored Asian ladybeetles seek out small caves and holes in limestone walls in which to spend the winter months. In Wisconsin, they look for houses, garages, sheds, holes in trees, firewood piles – anywhere where there are nooks and crannies in which to hide. Multicolored Asian ladybugs start to seek winter shelter during sunny days following the season’s first hard frost. Depending on location, this generally occurs in early October to mid-October; this can vary greatly from year-to-year. While overwintering, they do not feed or reproduce. Seal around doors and windows, external vents, bases of buildings and siding. Carefully apply insecticidal sprays to the outside of buildings as repellants. These can be applied by homeowners or professionals. Depending on the product’s residual effect and how long warm weather lingers, a second application may be necessary. Consider testing an out-of-sight area to make sure the insecticide does not cause any damage to siding or paint. Always follow label directions when applying pesticides. 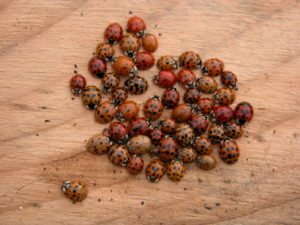 For more information on keeping ladybeetles out, visit UW-Extension’s website. Once inside, multicolored Asian ladybeetles tend to congregate in windows during the day. Removing them with a vacuum cleaner is effective when done on a daily basis. Vacuum bags should be emptied each time to prevent foul odors as ladybugs emit foul-smelling secretions when disturbed. The beetles may also be drowned in soapy water. Asian ladybeetles might bite when disturbed, but they are not overly aggressive. Ladybug larvae don’t look much like adults, but they also feed on aphids and scale insects. Photo: Linda Williams. Although they can be annoying in wintertime, Asian ladybugs provide some positive benefits the rest of the year. 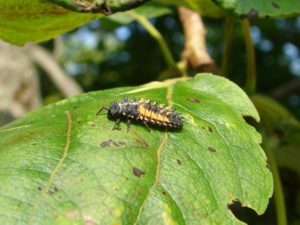 During the growing season, multicolored Asian ladybeetle adults and larvae feast on aphids and scale insects in gardens, agricultural fields and forests. During the fall, as aphid populations dwindle, ladybugs may feed on rotting or damaged fruit.